AUTOPULIT – Maquinaria para el Pulido Automático, S.A. from Sant Fruitós de Bages (Spain), one of the leading European producers of automatic machines for polishing, belt grinding, deburring and micro-finishing metal pieces, will participate at the BIEMH 2014 Fair, pavilion 1, stand C-63, presenting the latest technology in robots, which is part of its wide range of manufacturing. 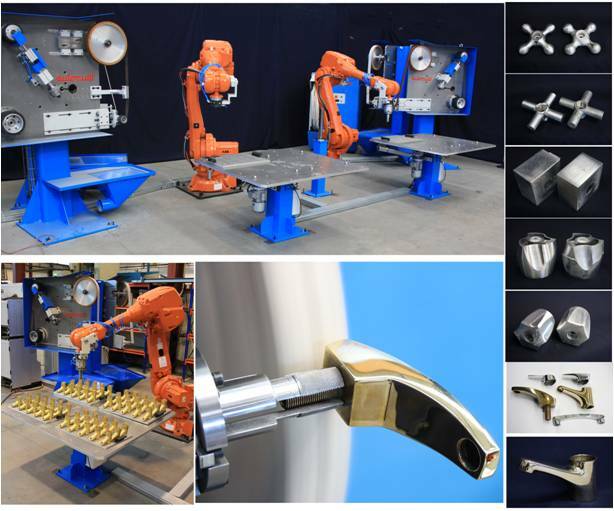 The exhibited robotic cell Model CR/UL+UP is a high-tech and flexible installation for deburring, belt-grinding and polishing complex pieces (water fittings, door handles, surgical instruments, prosthetics, automation parts, etc.). Its versatility allows the perfect finishing of different pieces totally automated, for small batches as well as for several hours of unattended operation.